With so many dozens of species and palettes of exotic pet birds to choose from, finding the right one for you can seem overwhelming. Below are just a handful birds for you to consider when searching for a bird buddy. 1. Miligold Macaw — These bird species are bred from Military Macaw and a Blue and Gold Macaw. With the best of both worlds, they are vibrant, affectionate, laid back, and may speak. 2. Red Factor Canary — Bred to induce the bright crimson of its name, these birds are born singers. Want to keep your canary red? It will require a special diet with concentrate of Carotenoids. 3. Budgie Bird — Called “parakeets” in the United States, they’re known as budgies everywhere else. 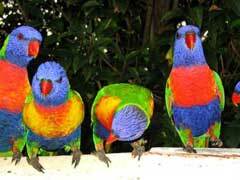 They socialize easily, and love people as much as other birds! 4. Jenday Conure — Playful and affectionate, these beautiful birds can be loud, but are excellent pets. 5. African Gray Parrot — One of the smartest exotic pet birds, some claim that these birds can learn speech enough to form crude sentences! 6. Umbrella Cockatoo — They require a lot of attention, but a dedicated owner will be rewarded: they learn speech readily, and can be taught a number of tricks. 7. Pacific Parrotlet — Parrotlets are a perfect choice for an owner who wants all the fun loving and personality of large, exotic pet birds, but don’t have the space or can’t handle screeching. 8. Amazon Parrot — Watch what you say around this quirky parrot. They learn speech and sounds quicker than most. 9. Scaly Headed Pionus Parrot — Rising in popularity, these parrots are amazing pets for those without huge time commitments. They play on their own with toys, and are a surprisingly quiet breed. 10. Blackheaded-Caique — These mid-sized parrots are incredibly playful and fun loving. Any object nearby that moves can become a toy for them. It must be noted that absent from this list are owls. As tempting as Harry Potter made the idea, in most countries is it illegal to keep owls as pets—and their wild and violent natures makes this a wise choice. Find the bird that’s right for you, and you will make a long-lived friend!